I can quote every single microscopic second of Pee Wee’s Big Adventure. Saying the lines from that movie is like breathing to me. “Is there something you’d like to share with the rest of us Amazing Larry?” I say like the exasperated Pee Wee when I’m stuck in a roomful of murmuring people or a crowd. “A scale model of the entire mall!” I may yell at the end of a grumpy tirade, just like Pee Wee does when he’s formulating a complex plan to reconstruct the theft of his beloved bike. I didn’t grow up with this movie. It came out when I was a kid. I watched it anytime it showed up on television on some lazy Saturday afternoon. But I didn’t have the same Rain-Man-like devotion to it that I did to Temple of Doom or Aliens. I fell in love with the movie when I was twenty years old and adrift on the sea of early adulthood. I got kicked out of college halfway through my junior year for insufficient financial aid and found myself having to seek gainful employment for the first time in my entire life. I had odd jobs before. In high school, I worked as a library assistant at school and our township library. The summer after I graduated, I interned at the prison where my father worked. (That’s another story for another day.) During my freshman year of college, I worked in the library reference department. At that age, I felt like if I moved back to my hometown, I’d probably wither and die of depression and lack of opportunity. Not because my hometown is terrible, but because I was largely known as a nerd there and I just didn't want to face that identity again. So I sought out my first ever apartment. As luck would have it, a friend had an internship that started in January and she needed a subleaser in the house she shared with several other girls. So I packed up my dorm room, Star Wars posters, Xanadu and Falco records, crappy acrylic paintings done by yours truly, and I moved into my first apartment and promptly got a job waiting tables in the dignified American institution that is The Olive Garden. The eighty dollars I could earn slinging spaghetti on a Saturday night seemed revelatory to me. Having money in my hands that didn't come from the Federal Government in the form of a financial aid check had a new rebel thrill to it. Feeling shy at first, when some of my roommates started to knock on my door and ask to look at my record and VHS collections, I began to open up and formed friendships that stand today as some of the most important I’ve ever made. For the first time ever, I felt like an honest to God adult. Not living at home or in a dorm was like a little slice of heaven. For under two hundred dollars a month, I could come and go as I pleased in my saucy red 88 Sundance. I could watch movies in my room anytime I wanted without bothering a roommate, and that was the part I really took advantage of the most. 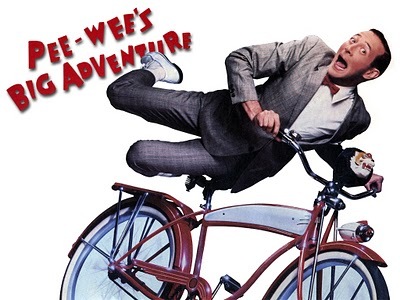 Without a roommate, without classes, without supervision, my television was on constantly, my DVD/VCR combo machine whirring like a quiet bird and radiating pure energy warmth, and the movie it fed through most often was Pee Wee’s Big Adventure. It wasn’t even my copy. I borrowed it from a male acquaintance’s dorm room one day before I was kicked out. Something about the cover appealed to me greatly, Pee Wee Herman on his shiny red bike jumping in the pure white air…he looked free. I wanted to be free. It just seemed like a good match. I thought of Pee Wee like an old friend, someone I hadn’t seen since grade school. My obsessive habits with movies were nothing new, by the way. I was wearing the actual tape in VHS tapes thin and crinkly by repetition by the time I was eight. I would stand in front of the TV and perform Ariana Richards’ screams during her most terrifying movie moments in Jurassic Park. After I startled my mother with my blood-curdling cries, I was instructed to keep it to a pantomime, so I would simply stand in the light cast by the TV silently acting out my doom by T-Rex over and over again, convinced I could someday become an award-winning actress. I used to roll the carpet back and watch Fred Astaire movies, donning my tap shoes and trying to mimic his steps. I pretended to be Marion Ravenwood in Raiders of the Lost Ark, jumping couch cushions like I was navigating the Well of Souls. I was Ripley from Aliens and countless other characters that spoke to me in some way, musical, adventure, or otherwise. I would hit entire phases of wanting to just live with a movie. In a movie. I would watch JAWS and then devour as many library books as I could on sharks, Steven Spielberg, and undersea life. I would watch Gene Kelly in Cover Girl and start talking with an old movie accent and start wearing vests to grade school. I was nothing if not thorough. And just when a phase hit its apex, I would move on to another. Hiding around corners with the white ray gun my Dad gave me one Christmas and asking my Mom to put my hair in buns on the side of my head. I was in love with movies. With the adventures they served on a silver platter, giving me hope that life could be dangerous, exciting, important, and musical. 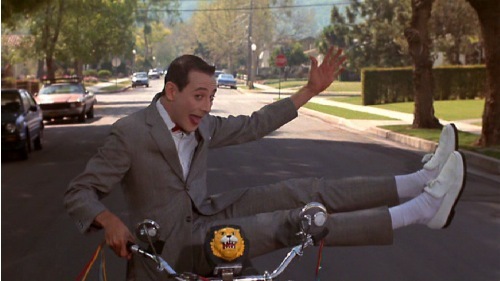 I re-watched Pee Wee’s Big Adventure once all the way through sitting alone in my room while folding and ironing laundry and laughed so hard that my lungs hurt. (And I don't have asthma...) So I immediately knew it was time for a phase. Because every second of that movie is funny and clever and beautiful. There’s not a potential joke or visual flourish that gets passed by, it's a movie that operates at its full cinematic potential. 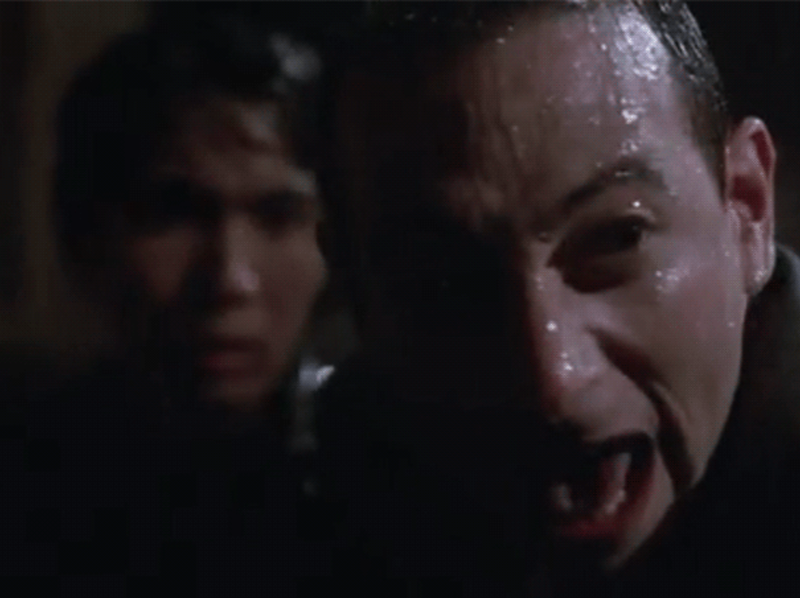 Paul Reubens is brilliant like Groucho Marx, Bugs Bunny, or Bill Murray is brilliant. 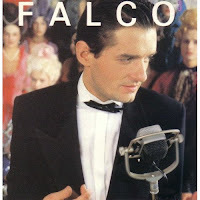 He was just the kind of fairy-tale, anti-hero, comedic genius that hit me right in the heart. Just the kind of character that stands out enough to be off-putting to society at large, but in the end, it turns out…they were right all along in whatever zany quest or strange behavior they displayed. Pee Wee had strength of conviction, even in his low and most depressed moments. He had a reason to press on. I was searching for one. Looking back, it makes perfect sense. Living on my own was so new to me and I was so unprepared for it that I didn’t even have furniture. Just a mattress and a box spring, all my geek artifacts, clothing, a stereo, and some incense cones. (and a “dance belt and a tube of chapstick”…) I turned over my plastic storage containers and covered them with blankets to craft a homemade nightstand and shelving unit. I pinned a large striped sheet to my wall to decorate because I didn’t have the time, permission or money to paint. I even had to bum the scotch tape to affix my “Battle of Geonosis” Star Wars poster to the back of my cracked wooden door. But Pee Wee’s house was glorious. I could sit in my cozy but tiny room, with the cracked door and one seriously dangerous wall heater (which I estimated was from at least the 1950s) and have something to aspire to. 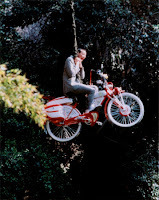 Pee Wee had a fireman’s pole and a breakfast machine and a dog and a special garage for his flying bicycle. He was old enough to own his own home and live alone, yet he decorated it like a toy store and a playground. Being an adult hadn't gotten him down or oppressed him at all. He was halfway between childhood and adulthood, and so was I. He would stop at nothing on his quest to get his bike back, crossing the country, depending on the kindness of strangers, and even diving into the danger of hitchhiking. Pee Wee had a quest. A reason for adventure. Despite the cartoon humor of the movie, Pee Wee ends up in some pretty dark places with some very shady characters in situations that could've easily turned into an episode of Law and Order. The movie is a thinly veiled fable about navigating some seriously adult dangers. Pee Wee dreams of losing his bike to various dangers, dinosaurs, and devils. I was dreaming that my life was slipping away. My education. 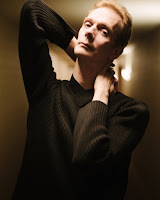 Any clear direction or hope of having some kind of creative career or the magic that I craved having been raised by a singing telegram performing mother and a childhood crammed with movie magic. It was all slipping away. It only took a calender year to pay my way back into school and finish my undergraduate degree and discover creative writing, which still took me longer than it would take your average anonymous invertebrate life form to craft some kind of rudimentary hand tool and evolve to the next phase of life. And finishing my Masters Degree, I've yet to escape the gravitational pull of the American Education System...I think I may have signed a contract at some point that says I can be drafted into slave labor on an old timey pirate ship if I default on any of my loans. 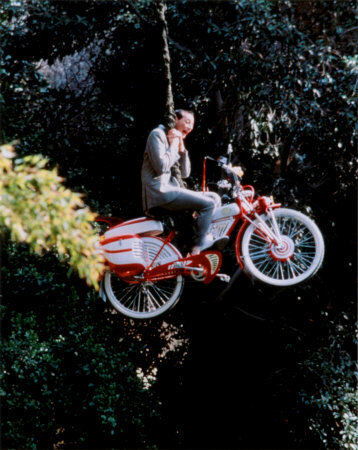 But Pee Wee found his bike and I found my life. I think. Almost. I’m getting there anyway. I’m probably past the part where I learn there’s no basement in the Alamo, and I think I’m past the studio gates and wandering free among the backlots of Hollywood. But I don’t have the bike in my hands yet and that child star is really starting to get on my nerves. Wherever I am, I can always put Pee Wee's Big Adventure in and play it on loop, though now I own it as a DVD and I can afford my own scotch tape for my Star Wars posters. But without Pee Wee as a role model for strength of will and the power of imagination, I might still be waiting tables somewhere.